I’m trying to be really organised with my own family photos this year and I’m sorting through them and putting them in montages as soon as I’ve taken them so at the end of the year I can just put them straight into a digital album. I have just finished my 2011 family album, and I still have 2012 to do. (And now I’m about to go into the busy spring shooting season that probably won’t get done for a while!) So I thought I’d make my life easy this year and try to organise my photos as I go along. There is nothing more overwhelming than having thousands of photos sat on a hard drive! It also means that I can share more of my own family photos on my blog as they are already in a montage which is super simple for me to post on here! At the end of the year I order a 12×12″ digital album so I put my photos all into square montages like the one below so that I can just upload them easily at the end of the year. You can read here why I think it’s so important that you print out your photos. We had my big boy’s 5th birthday party on Saturday. It’s always tricky to get the right balance between taking some photos of special times like this, but also making sure that you are present there and enjoying it without a camera in front of your face. So I always make sure I take a few photos, but also put the camera down and enjoy myself too! I’m so pleased we had an entertainer again, there is no way I could have entertained 16 five year old for 2 hours myself. Joanne from Act One Adventures did a fantastic job, the kids all loved her! 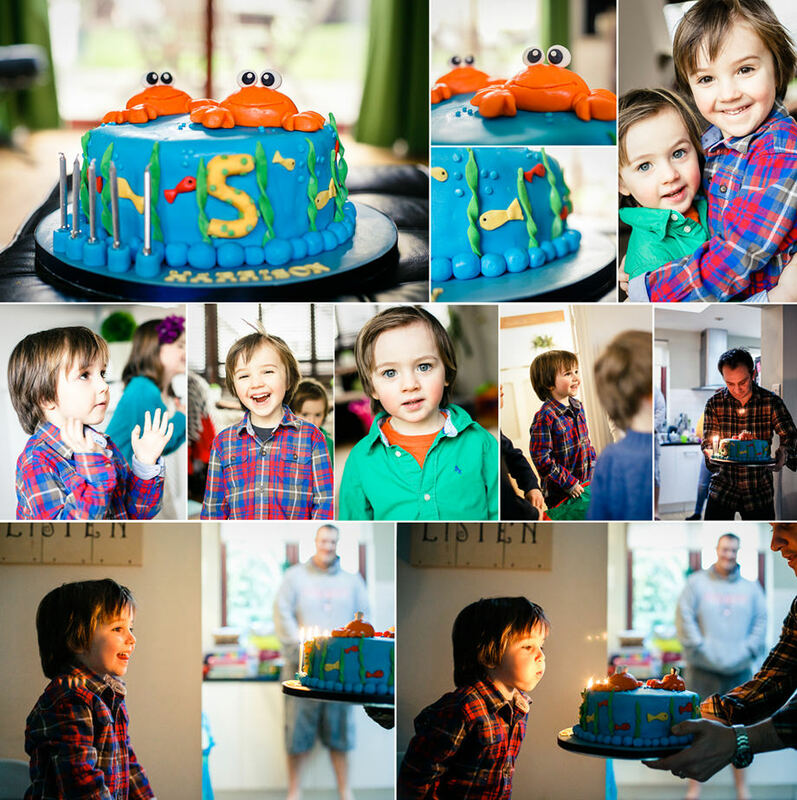 H is obsessed with anything that lives in the sea (particularly crabs and sharks) so an under the sea party was the obvious choice! He knows the names of more sea creatures than I do and currently wants to be a marine biologist when he grows up! I would love to say that I made the under the sea cake, but anyone aware of my baking skills will know that I didn’t! Our friend Nikki made it, isn’t it great? 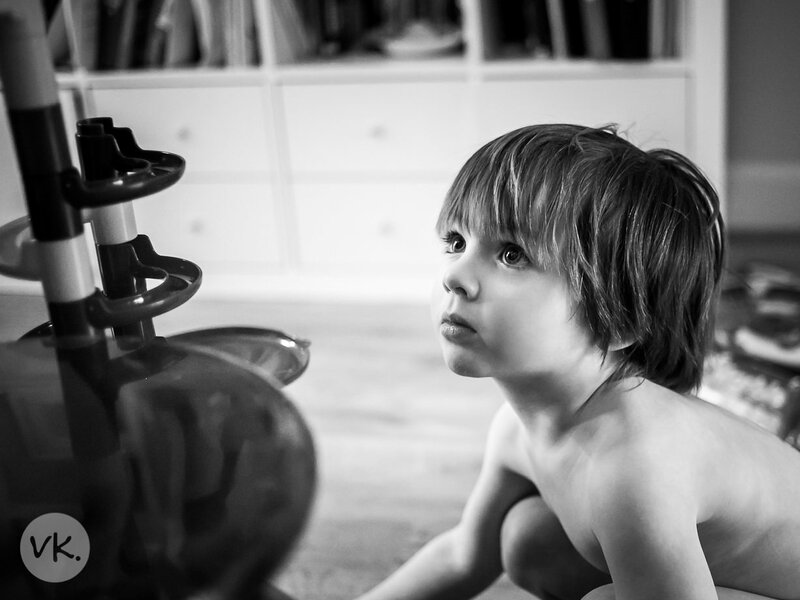 And I just thought I’d share this photo below of my little boy playing with the marble run before the party started as I love it. And yes I know it’s winter and he hasn’t got any clothes on…he’s going through one of those toddler stages when he wants to remove his clothes a lot! And just a quick shameless plug (hopefully you don’t mind! 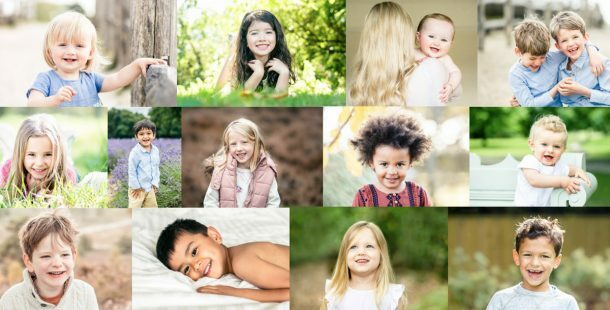 )…if you want to capture your own family story beautifully, join us on my next photography workshop for parents in Surbiton.